Basic description: servo extension cable, JR colors. 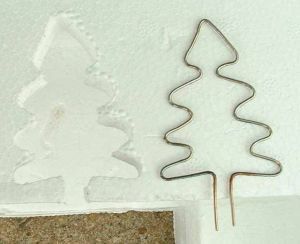 Flexible wire with silicon rubber insulation, cross-over 0.5 mm2, insulation color white, maximal current 25 A. Price per 1 m.
Basic description: ISA-CHROM30 resistive wire 0.6 mm. Basic description: servo extension cable, Hitec or FUTABA colors. 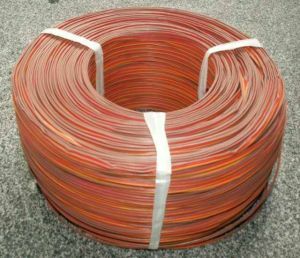 Flexible wire with silicon rubber insulation, cross-over 0.5 mm2, insulation color red, maximal current 25 A. Price per 1 m.
Manganin wire diameter 0,5 mm, resistance 2.2 Ohm per meter, very stabile, for shunt resistors for current to 2.5 A or as wire for heat polystyrene boards cutting, current 3 to 4 A, voltage 6.6 to 8.8 V per m.
Basic description: flexible wire, crossover 0.12 mm2, PVC orange isolation, current to 3 A, price per 1 m.
Flexible wire with silicon rubber insulation, cross-over 1 mm2, insulation color black, maximal current 41 A. 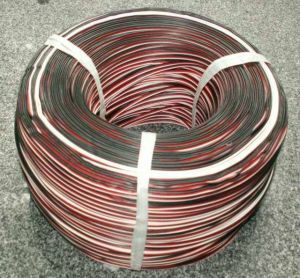 Price per 1 m.
Manganin wire diameter 1 mm, resistance 0.55 Ohm per meter, very stabile, for shunt resistors for current to 5 A or as wire for heat polystyrene boards cutting, current 6 to 8 A, voltage 3 to 4 V per m.
Flexible wire with silicon rubber insulation, cross-over 1 mm2, insulation color red, maximal current 41 A. 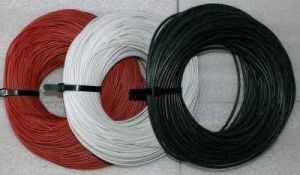 Price per 1 m.
Basic description: flexible wire, crossover 0.12 mm2, PVC brown isolation, current to 3 A, price per 1 m.
Basic description: flexible wire, crossover 0.35 mm2, PVC black isolation, current to 10 A, price per 1 m.
Basic description: flexible wire, crossover 0.35 mm2, PVC red isolation, current to 10 A, price per 1 m.
Basic description: flexible wire, crossover 0.35 mm2, PVC blue isolation, current to 10 A, price per 1 m.
Basic description: flexible wire, crossover 0.35 mm2, PVC light blue isolation, current to 10 A, price per 1 m.
Flexible wire with silicon rubber insulation, cross-over 1.5 mm2, insulation color black, maximal current 52 A. Price per 1 m.